Pests making their appearance this time of year are mosquitos, scorpions, spiders, earwigs, roaches, and gnats, among others. The best prevention against these annoying bugs is routine pest control. You can help prevent (or at least minimize) the infestations by making sure any standing water is remedied by fixing leaky faucets, lowering the amount of time your sprinklers run, keeping your pool clean & chlorinated, and making sure decorative ponds are aerated in order to keep water moving. Other measures you can take are: Keep your yard free of debris, like leaves, mulch piles, etc. Make sure pet food is stored in a sealed container & the feeding area is kept clean. Please contact us for an estimate if your pest situation is past the point of “prevention” and you need effective, customized pest control service. The Arizona Bark Scorpion is a small light brown scorpion common to the southwest United States. The range of the scorpion is the Sonoran Desert, though less toxic relatives of the scorpion are located throughout the Southern US. An adult male can reach 8 cm in length (3.14 inches), while a female is slightly smaller, with a maximum length of 7 cm (2.75 inches). The Bark Scorpion is nocturnal, prefers to ambush its prey, and typically feeds on crickets and roaches. Its primary predators are snakes and tarantulas. Bark Scorpions have a gestation period of several months, and are born live, gently guided onto their mother’s back. A female Bark Scorpion typically gives birth to between 25-35 young,and the young will remain with their mother until their first molt, up to 3 weeks after birth. Bark scorpions may live up to 6 years. While nearly all scorpions are solitary, the Bark Scorpion is a rare exception: during winter packs of 20 to 30 scorpions can congregate. Bark Scorpions, like most other scorpions, are incredibly resilient. Lab experiments have frozen the scorpions for weeks, and after being thawed, the scorpion emerged unharmed. During US nuclear testing, scorpions were found near ground zero with no recorded adverse effects. The Bark Scorpion is particularly well adapted to the desert: layers of fat on its exoskeleton make it resistant to water loss. Nevertheless, Bark Scorpions hide during the heat of the day, typically under rocks, wood piles, or tree bark. Bark Scorpions do not burrow, and are commonly found in homes, requiring only 1/16th of an inch for entry. Arizona Bark Scorpions prefer riparian areas with mesquite, cottonwood, and sycamore groves, all of which have sufficient moisture and humidity to support insects and other prey species. The popularity of irrigated lawns, and other systems which increase environmental humidity in residential areas, has led to an explosion in the number of these animals in some areas. The Bark Scorpion is unusual in that it is the only species in the southwest that regularly climbs walls, trees, and other objects with a sufficiently rough surface. Bark Scorpions practice negative geotaxis, preferring an upside down orientation, which often results in people being stung due to the scorpion being on the underside of an object. The Bark Scorpion is the most venomous scorpion in North America, and in sufficient quantities its venom will cause severe pain (coupled with numbness and tingling) in adult humans, typically lasting between 24 to 72 hours. Temporary dysfunction in the area stung is common; e.g. a hand or possibly arm can be immobilized, or experience convulsions. It also may occur loss of breath for a short period of time. Due to the extreme pain induced, many victims describe sensations of electrical jolts after envenomation. Fatalities from the venom are rare in the USA, and are limited to small animals (including most pets), small children, and adults allergic to the venom. Extreme reaction to the venom is indicated by numbness, frothing at the mouth, paralysis, and convulsions. Two recorded fatalities have occurred in the state of Arizona since 1968: the number of victims stung each year in Arizona is estimated to be in the thousands. In Mexico, more than 100,000 are stung annually, and at its worst period, the Bark Scorpion claimed up to 800 lives annually during the 1980s. 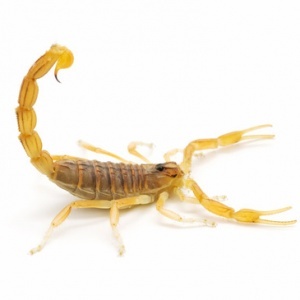 Cartee Pest Control offers effective treatment for scorpions. Should your home become infested with these desert critters, give us a call and we’ll help eradicate them. Wash or rinse dirty dishes immediately after use. Consistently clean food storage & cooking areas with a sanitizer or anti-bacterial solution. Keep food/crumbs off the floor. Properly seal and store pet foods, clean around pets’ feeding area(s) and avoid leaving pet food in bowls/dishes overnight. Keep a dry environment inside and outside. Fix leaky faucets and cut back on sprinkler times if standing water is observed. Eliminate yard debris. This can be anything from leaves on the ground, grass waste, mulch piles, etc. Check, double check, and triple check all cardboard boxes brought into your home from an outside source. Should you still happen to become a host to these uninvited guests, give us a call & we’ll take care of them for you! Cartee Pest Control offers effective removal of bees & hives. Generally, if you see a swarm of bees around a tree or bush, they tend to move on in about 2-3 days. However, if the bees remain longer than that, there is a good chance they’re making a home for themselves, and you should call Cartee Pest Control to schedule an appointment for removal. © Cartee Pest Control, LLC · 1999-2017 · All rights reserved.